There is nothing more exciting and intimidating for parents as the first time you send your daughter away for sleepaway camp. You may have met the directors, read the brochures, and toured the camp, but there are still a lot of things left for you to do and some important things you should know. With less than three months left to Opening Day, now is the time to prepare your daughter, and yourself, for summer and life at camp. There are many things you can do now before summer starts to get your daughter ready and excited for Waukeela. If she has never spent a night away from home, arrange a sleepover at the home of one of her friends or with a relative to familiarize her with the sensation of spending the night away from home. When talking to her about camp, emphasize all of the cool things she can try here that she can’t try at home, like archery, pottery, canoeing, or the ropes course. Although you may be tempted to oversell camp as the best experience ever, be honest with your daughter. Tell her it may be rough at first and that she may miss home, but if she sticks it out and focuses on all of the fun things around her, she will have a blast. At Waukeela, we typically limit most parent-camper communication to letters, so be prepared. Make letter writing exciting and easy for her by finding fun stationery and preparing envelopes with address labels and stamps. When you write letters to her, make sure that they are all centered on camp. Ask her questions about her friends, her cabin, her favorite counselors, and her favorite activities. It is okay to share general updates from home, but if you write too much about it or about missing her, you might make her homesick. If you have concerns about her adjusting to camp life, you can always call our directors. Once you and your daughter have said your goodbyes, take a deep breath and relax. It might sound crazy, but if your daughter is away having the time of her life, you should try enjoying your summer too. Step away from the camp pictures on Facebook and go out for a nice dinner, catch up on your DVR, or take a little day trip. Now is you chance to enjoy all of the things you want to do but can’t do when you are busy being an awesome parent. You will definitely still worry and miss her, but for her sake as well as yours, take time to recharge this summer while she’s gone and prepare for the next 10 months you’ll spend with her before sending her back to camp. The pictures will still be there when you get back. 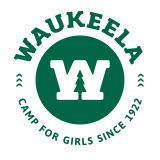 A summer at Waukeela is one of the most wonderful and memorable gifts that you could give your daughter. If you prepare her right and give her the chance to thrive, she will always thank you for it. Although it will be hard to be without your daughter for a few weeks, just know that she will be in the very good hands of our amazing staff and she will greet you at Closing Day with a big smile, lots of new friends, tons of great stories, and the spirit of Waukeela in her heart!